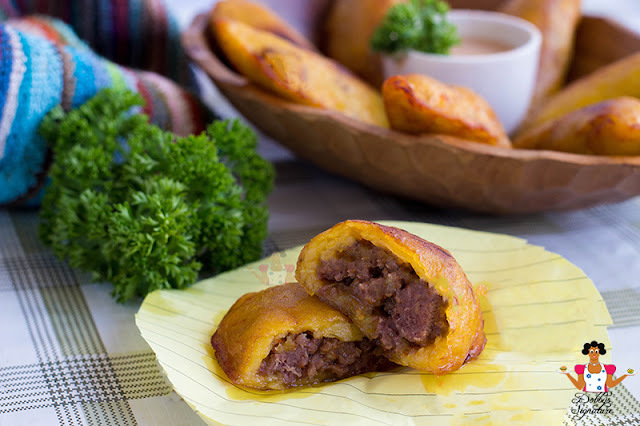 Sweet, savory plantain empanadas are a delight for the whole fam every single time i make it. I've always loved plantain (Duh! abeg who doesn't?) but making empanadas with yummy fillings is a whole different ball game entirely. 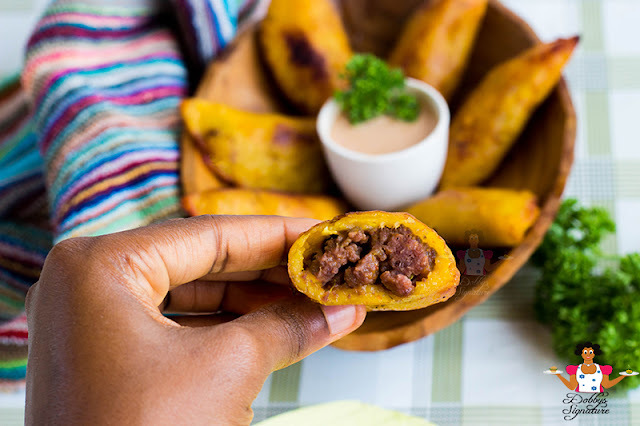 The good thing about plantain empanadas is you can fill it with just about anything. For this to turn out really nice, you'd need ripe plantain. 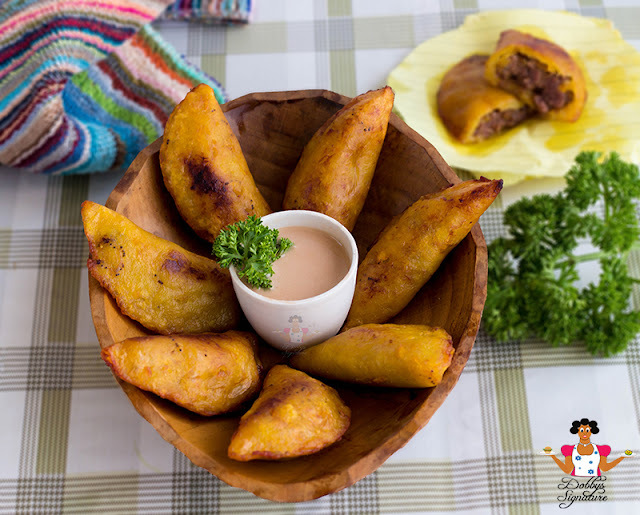 What i usually do is to make plantain empanadas and store in the refrigerator and whenever anyone is ready, all the person has to do is to bring them out of the fridge and fry for breakfast, lunch or dinner. 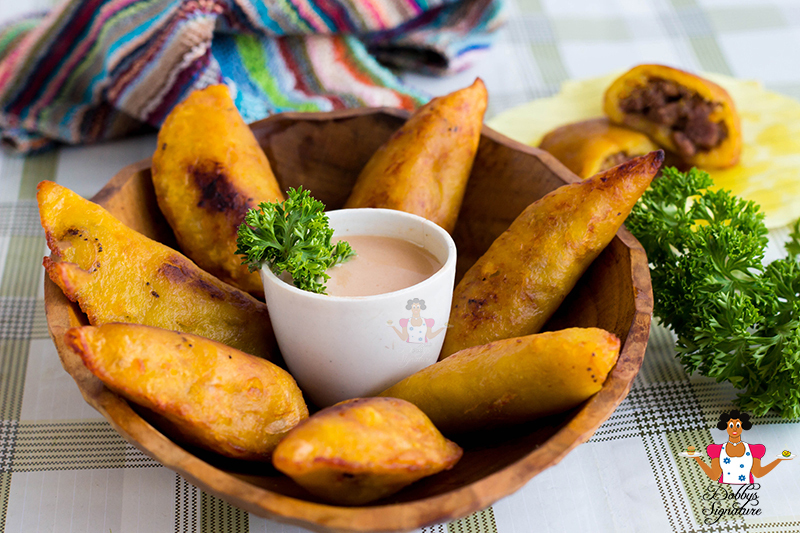 if you have a party, you can even serve plantain empanadas as an appetizer. Empanadas are best eaten warm and freshly fried with hot pepper sauce like ata din din served with hot or cold cup of beverage by the side. Step 1: If you don't have where to buy minced meat, you could also grind your meat.This is really easy to do if you have a mincer, Grinder/ food processor. It also saves a whole lot of stress and money. To start, Wash the meat thoroughly with clean water then slice off the elastic muscles with a sharp Knife. Most times the grinder is not able to grind this part of the meat. Dice the meat into smaller chunks and place in the grinder - Grind. To skip this process, simply get minced meat. Step 2: Steam the minced meat in a separate pot for 10 minutes with a cup of water and salt to taste. In a pan, heat up 2 tbsps. Vegetable oil for 2 minutes. Add the dice onion, steamed minced meat, chili powder. Sprinkle with salt and crushed seasoning and stir fry for about 5 minutes. Turn off the burner and set aside. Pre-heat the oil in a pan and Drop the plantain empanadas into it, one at a time making sure you do not crowd the pan. Fry until golden brown. Remove from the oil and drain on a paper towel. Serve as a snack. Awww dobby you keep inspiring me with every single recipe... Keep up the good work PS I'm so trying out this recipe. Hehehe creativity on point, I can't believe my eyes. This is lovely and it's making my tummy cry for some. Keep it up dobby. Dobby this is creativity at its peak. Thanks but can one add flour? Just asking though. Keep it up. Thanks kemikane. Flour isn't needed for this. Wao! Looks easy and yummy, sure will try this out. Wao! Easy and yummy, I'm trying this out tomorrow. Tx Debby. Wao! This is easy and yummy, I'm trying this out tomorrow. Wao! Easy and yummy, I'm trying this out tomorrow. yumyum yum!! amazing photos too. great work as always sisi. It sure is. Do let us know how it goes. Will the plantain form like a dough after mashing it so it can hold the minced meat? I'm soOooooo trying out this recipe this weekend . Can I add flour? No Ada, Flour is not needed. Now, I'm just salivating! Dobby, WHY????? That's great Favour. Glad you enjoyed it. Hi Dobby, nice recipe! For us team #teamfitfam, can this be grilled not fried?? I really hope so cause I definitely wanna try this! Yes you can although you'd end up with a dry version of the original instead. Hi Dobby, nice recipe! For us team fit fam, can this be grilled instead?? I really hope so! Yes you can use cornbeef. Blender, No...Food processor, Yes. Hi Innocent, you could try using a parchment paper or cling film nylon for the whole maneuvering. It's easier that way. Hi dobby I tried it today but it broke in two and became flat after i had put in d minced meat and tried to fold.....what should i do? Can u pls make a video of this? Hi Innocent,okay would do a video on it. Hello Dobby, how do you steam the minced meat?